Both are animated features steeped in the aesthetics and customs of Day of the Dead: the Mexican tradition of creating elaborate altars, painted skulls and paths of marigolds to welcome the spirits of dead loved ones for a temporary visit to the world of the living. And both films focus on a young boy who follows his musical dreams at the risk of disappointing his family. So it seemed like familiar territory, which made it all the more unexpected to find myself transported into a fabulously colorful, slightly psychedelic and entirely magical world where I was so wrapped up in the story about families connecting across generations that the tears on my cheek took me by surprise. Pixar has always had a knack for tugging at the heartstrings of grown-ups while delighting younger viewers with good-natured characters and eye-popping visuals. Those elements are also at work here, but not since “Up” has an animated film delved so deeply into the web of relationships woven on the way to old age, nor has Pixar ever looked so closely at a specific cultural tradition. The result is a rich experience for any audience: a story of family and culture, death and transcendence, all set to vibrant Latin music — including a new song by Oscar winners Kristen Anderson-Lopez and Robert Lopez (“Frozen”) — and awash in the brilliant colors and dazzling designs the imaginative talents at Disney and Pixar are known for. 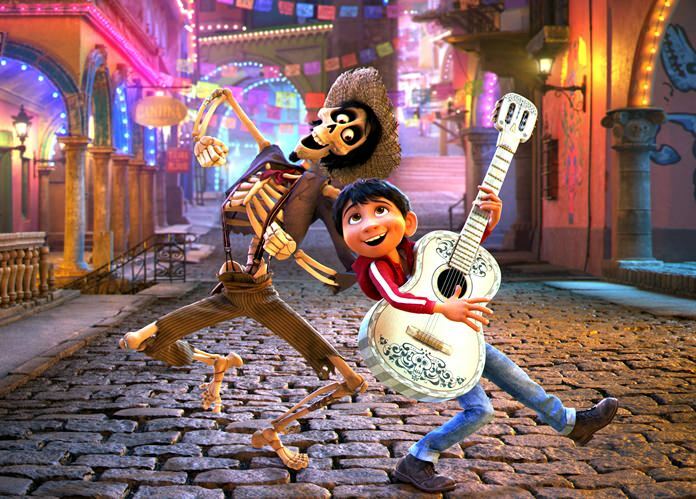 “Coco” centers on Miguel (newcomer Anthony Gonzalez), a 12-year-old with the heart of a musician born into a family of shoemakers who’ve banned music for generations. His great-great-grandfather was a guitarist who left his great-great-grandmother alone to raise their young daughter, Coco, and the Riveras forbade all music after that. By the time Miguel comes along, Coco is the elderly matriarch of the family: a kind-faced collection of wrinkles who sits quietly in her room all day. Miguel feels disconnected from his family history and resentful that it would prevent him from being like his idol: Ernesto de la Cruz (Benjamin Bratt), Mexico’s most beloved musician. As Miguel’s family prepares for the Dia de Muertos holiday, stacking a colorful altar with food, flowers and family photos, he defiantly takes off in pursuit of music, hoping to compete in a neighborhood showcase that would confirm his talents. But his attempts to procure a guitar accidentally lead him across the golden bridge into the realm of the dead. In this otherworldly place, Miguel uncovers a mystery, connects with a quirky guy named Hector (Gael Garcia Bernal), and meets generations of relatives he’s only known through old photos. He encounters magical alebrijes, fantastical spirit animals that help guide the lost. And he realizes that his musical dream could be more meaningful than he thought — especially for Mama Coco — but he’ll need his family’s support to return to the land of the living. With “Coco” (which is a bit of a misnomer, since it’s really Miguel’s journey), director Lee Unkrich (“Toy Story 3”) and screenwriter/co-director Adrian Molina have crafted a timeless and beautiful tale that’s classically Pixar: playful, inventive and profound. It’s a universal story of love and belonging set in a kaleidoscopic world of brilliant apparitions and lively, well-dressed skeletons. The animation is exceptional: Realistic elements, like Mama Coco’s gnarled, arthritic hands, look absolutely lifelike, while the spirit world is populated by buildings and bodies that defy gravity. Like the multicolored, flying tiger-dragon that swoops through Miguel’s adventure into the land of spirits, “Coco” is a thrilling and joyous vision, a celebration of life and the loving tradition of the Day of the Dead. “Coco,” a Disney-Pixar release, is rated PG by the Motion Picture Association of America for “thematic elements.” Running time: 109 minutes. Four stars out of four.